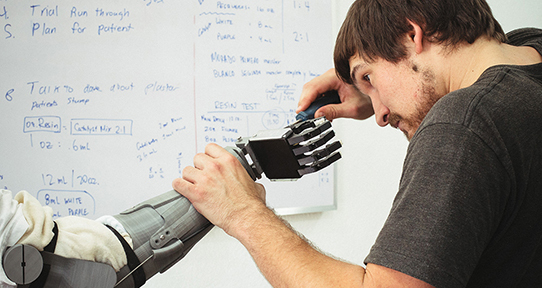 Josh Coutts is the lead designer for the Victoria Hand Project (VHP), a nonprofit based in the UVic's Biomedical Design and Systems Lab headed by mechanical engineer Nikolai Dechev. The VHP helps amputees in developing nations by providing them with low-cost, highly functional and custom-fitted 3D-printed, upper-limb prostheses. Photo: Jake Farmer. What will you do with your engineering or computer science degree? John is available to meet with students, whether in the co-op program or not. Visit learninginmotion.uvic.ca for more information or to book an appointment.